CloudBet DO NOT ACCEPT USA , Hong Kong, UK and Singapore players. 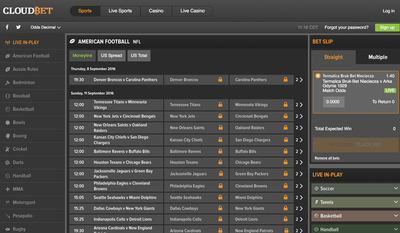 Bet up to 120 BTC on NFL football, English soccer, NBA basketball, hockey & more . All bitcoin transactions are processed free of charge and processed instantly. CloudBet is the top "bitcoin only" bookmaker for live in-play betting on sports. Cloudbet is fully licensed and regulated by the government of Montenegro. Fast sign-up. You only need to provide a username, password and your date of birth. 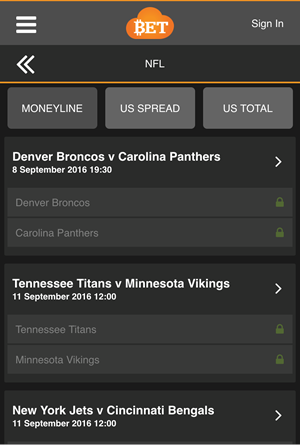 Wager on sports or play casino games on any iPhone, Android or Windows Phone. New depositors at Cloudbet sportsbook are entitled to a 5 bitcoin welcome bonus. 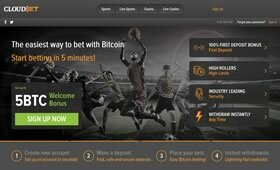 Cloudbet Sportsbook is one of the biggest and most trusted brands in bitcoin sports betting. The site is USA friendly and it takes only seconds to fill out an anonymous e-mail sign-up form to begin placing wagers. Cloudbet was established in 2013 and is one of a select few bitcoin gambling sites are licensed and regulated. Cloudbet cater for both recreation gamblers and high rollers. 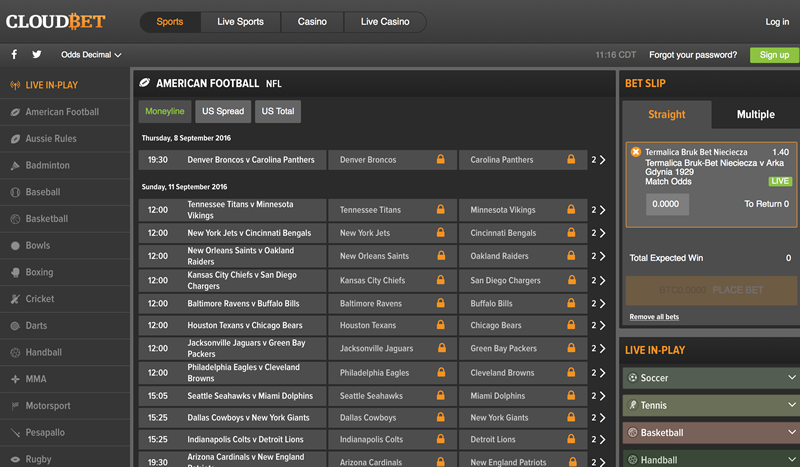 Their max bets of up to 200 BTC on the NFL, NBA, NHL, and EPL are some of the highest you'll find anywhere online. When you first visit Cloudbet, you'll notice the site pulls off a very sleek 'legit' look that puts more established traditional bookmakers like 5Dimes to shame. Cloudbet also features a casino, which can be a nice way to pick up some extra BTC why you're waiting for a line to be released. As for sports betting, the layout of Cloudbet follows the accepted standard that most online wagerers are familiar with. Sports/Leagues to the left, games in the middle, and ticket to the right of your computer is a simple formula that works. 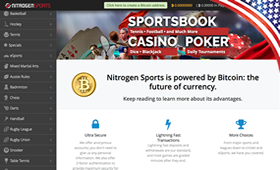 CloudBet does offer a better in-play betting service than Nitrogen Sports, Betcoin Sports and other bitcoin-only sportsbooks. Like most sportsbooks that are bitcoin exclusive, CloudBet caters mainly to American sports with a little bit of some European soccer available. For many bettors, that's perfectly fine as they mainly just bet on the NFL, MLB, NBA, and NHL anyway. Cloudbet will hook you up though if you want some variety. 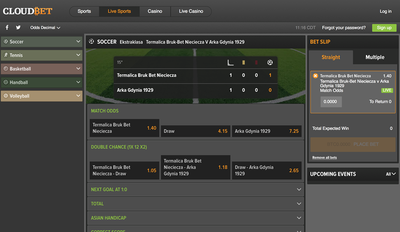 They have 18 different sports available, often with multiple markets within each category. If you've been searching the web for that elusive Champions League Waterpolo spread or trying to back an underdog for the Gibraltar Darts Trophy, Cloudbet has you covered. Australian Football (AFL) and rugby (NRL) are also present. 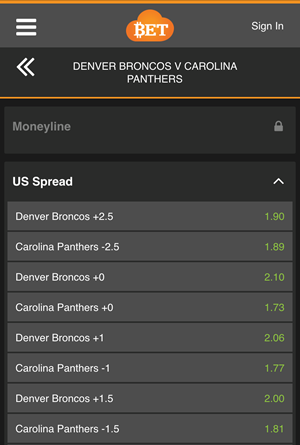 Most of these sports have live betting options available too, including 5-inning lines, halftime scores, and Asian handicapping to name a few. Deposit will hit your account after 1 confirmation so you usually won't need to wait more than a few minutes. Large withdrawals need to be processed manually so they can take a few hours. Smaller payouts happen instantly. There are no cashier fees. Both the CloudBet sportsbook and casino work great on any Android, Windows Phone or iOS smartphone or tablet.​ Visit our Recommended Sportsbook App Guide for a full list of the best mobile booies. All questions associated with the sportsbook or the site in general are done via email. There is currently no live chat, although you can ask questions via Twitter and Facebook. CloudBet take security seriously and offer their players the options of Two-Step verification using Google Authenticator. Most bitcoin sportsbooks do not offer new players a deposit bonus because it is so easy to create multiple account. CloudBet is the exception here as they offer new sports bettors a 100% welcome bonus up to 5 BTC. Many online books that deal in other currencies require a certain number of rollovers before you can claim your bonus – this is an accepted industry practice so that people aren't instantly doubling their money and cashing out. 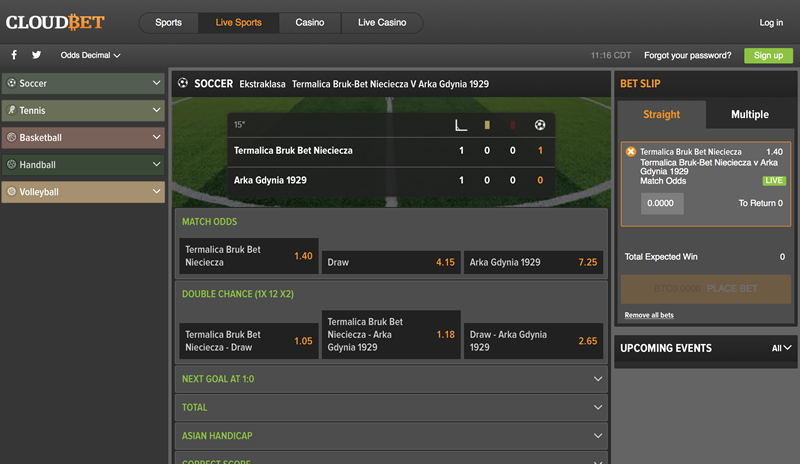 Cloudbet works a little different but with the same rollover premise. They give customers loyalty points for every bet placed, and for every 800 loyalty points earned, .01 BTC of the bonus are released. 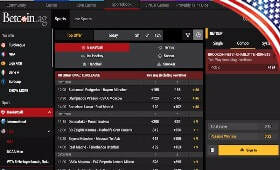 Most traditional currency sportsbooks such as Bovada cater only to the recreational player. For those who are frustrated with low max bets and dual lines, Cloudbet could be your answer. With a 200 BTC max bet limit for major games in the English Premier League, NFL, NBA and MLB, CloudBet is the bitcoin sports betting site of choice for high-rollers.